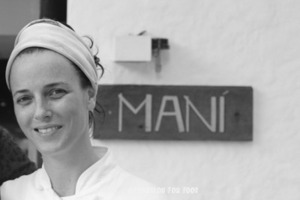 After reading an article about Helena Rizzo who has been named the best´s female chef of 2014 I just dreamed about visiting her restaurant Mani Manioca in Sao Paulo. The award had been given to her with the motivation “Their clever cooking, respectful of traditional Brazilian culinary practices and ingredients, is married with modern technique and sprinkled with Spanish influence”. I asked some of my friends if they would like to join me and in half an hour we were 10 people ready to go to Mani. When we came there Helena Rizzo was standing outside her restaurant talking to some people. I took with me my camera and when she was free I kindly ask for picture with her. Her simplicity, warm and authentic appearance just stroke me and I felt so happy to be able to stand beside her. As usually in those situations you cannot speak, you just enjoy the moment and no words are needed!!! As a starter I ordered Waldorf Salad – apple jelly with celery sorbet, nuts and gorgonzola emulsion. I was amazed by the taste of celery sorbet and the great combination of apple jelly and gorgonzola. Main course surprised me with different colors and shapes; I ordered Lamb (low temperature) with baked roots and roasted Brazilian nuts with manioc flour. The meat was beautifully soft and juicy and the baked roots were just right for this dish. Hmm I really liked my choice of dishes and as I understand the ladies who were with me were also very satisfied. Thank you Helena and your great team for bringing us closer to the Brazilian cousine and your way of cooking!! !